The Irish word for this territorial division, cúige, literally meaning “fifth part”, indicates that there were once five; the fifth province, Meath, was incorporated into Leinster, with parts going to Ulster. The provinces of Ireland serve no administrative or political purposes, but function as historical and cultural entities. 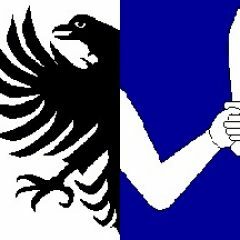 The province of Connacht (Connachta in Irish), Anglicised is Connaught. It is named after the “Connachta” – these People who claimed descent from the mythical Conn of the Hundred Battles (Conn Cétchathach) High King of Ireland, in the Middles Ages (2nd Century). The name Connachta means “the descendants of Conn”. Connacht is traditionally described as the kingdom of learning and the home of the greatest and wisest druids and magicians. Men from Connacht are famed for their eloquence, their handsomeness and their ability to pronounce true judgement. THE HISTORY WE WERE TAUGHT WAS A LIE (and is still, sadly, taught in Text Books). Much, not all, is mostly wrong. Remember the winners of (Wars) write their History. 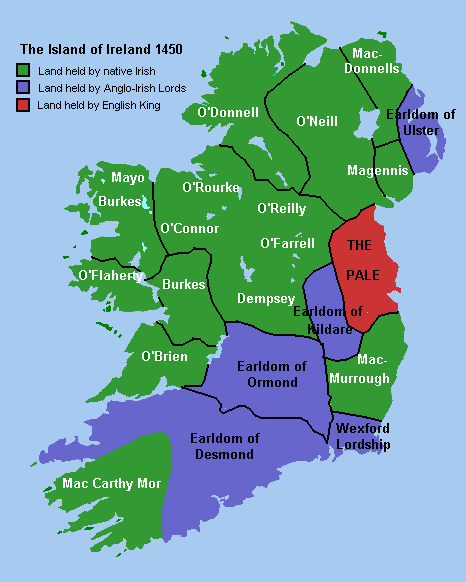 England had the Boot on the neck of Ireland for more than 800 years (and won for that time)! Even today, it is almost impossible to reverse the printed books with the lies they told for 800+ years. So critical thinking is required. Do not believe everything you read, or were taught. Even today, 2017, Ireland is still dealing with this legacy and navigating turbulent waters with it’s Island neighbor (and the Continent). By the 1450s things had changed as “The Pale” was the only area really controlled by English King (and all the former “Grants” seem to have been forgeries or based on taking advantage of Roman Catholic Pope’s “Bulls” that said one thing and the English said they meant something else- a real mess they created). One has to remember back then most did not read and the only people who did were Religious Monks. were just stories made up from “Whole Cloth” to fit with the then current power struggles (being they had to assert some reason for their right to rule others, or they would been challenged immediately). Today, with DNA, We are seeing that many of the Septs in Ireland were generally not one family unit, but a grouping of sometimes related, sometimes unrelated People. Several yDNA Haplogroups have a strong presence in the NW Ireland to this very day – as We do more DNA testing and unravel the relationships more and more. We hope to know and learn more once better and faster, and cheaper DNA testing is possible. One thing is sure — we are only in Chapter 1 of the DNA book (of who knows how many chapters of this DNA Book). The R-M222 branch of the Y-DNA tree is defined by a Single Nucleotide Polymorphism (SNP) called M222. This diagnostic marker is associated with many individuals whose roots lie in the counties of Northwest Ireland, Ulster and Lowland Scotland. In most cases the first three STRs in the list above are adequate to establish membership in this group. If you have at least two of those three values and differ by only one at the mismatching marker, you are very probably (though not certainly) a member of the R-M222 Haplogroup. The cluster was initially referred to as the 25/11/14 cluster based on the dominant values for DYS390, 391 and 392. In late 2005 a research team from Trinity College Dublin published a report that identified this cluster based on the distinctive values at DYS390 and 392. The research team called this pattern the Irish Modal Haplotype or IMH, and provocatively suggested that the haplotype was to be associated with the Ui Neill kings of Northern Ireland who descended from the fifth-century warlord Niall of the Nine Hostages. Since the haplotype is not, in fact, modal in Ireland – through a distinctive haplotype with a large population, it is not the dominant one – one should perhaps more properly call this pattern the Northern Irish/Lowland Scots Variety of Haplogroup R1b. That recognizes the fact that it is most concentrated in Donegal (nearly 20 percent of the population) and nearby counties to the south and west (five to 10 percent). It is also found in Lowland Scotland and the Western Isles at a percentage that is hard to determine but may also be in the five to 10 percent range. The modal haplotype for the Northern Irish/Lowland Scots Variety, and therefore for R-M222, can be seen on Ysearch as record M5UKQ. We will continue to develop the precise yDNA of the area. It is hoped that Surnames (which were well developed by the 1400s) could be added, but there are essentially arbitrary names People adopted — they are very important to Us — indeed Surname is our Identity. But, as was found when research and DNA tested advanced, it became clear much of the so-called “History” we have been taught, was in fact stories – many unrelated people populated the areas. Indeed, Kilmacteige Parish does have a few related Surnames, and over the Centuries, intermarriage, adoption, and NPEs changed this — these Families, today, most who have deep history in the area all might have the Surname, but when We look at DNA, they are all not related by DNA –to each other. Obviously, Marriage brings in new DNA and this happens over and over by descent of the Children. It is all very complex, no doubt, so keep an eye on these pages and We will try to keep it updated with new significant developments. In 1874 Queen Victoria granted the title Duke of Connaught and Strathearn to (her third Son) Prince Arthur. Expanding on 17,788 km2 (6,867 sq mi) and with a mere 542,000 inhabitants, Connacht is the smallest and least populous Irish province. It was the last province to come under English rule, and the one where Irish Gaelic is the most widely spoken today, particularly in County Galway, where half of the population has at least some ability in the language.